I think I have grown more sentimental since I moved 8,000 miles away from my family. Every memory I have of home seems to be sepia-tinted and filled with gentle smiles. 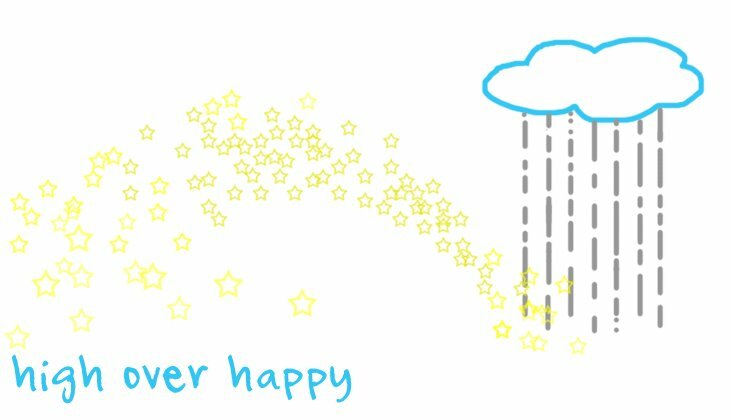 There is no darkness, no anger, no crying. Yes, this must be a side effect of homesickness and I won't worry yet until I see small children running in slow motion. But it's nice being able to go to that happy place when life gets intimidating. When I spoke to my mum on Friday, she was telling me how my niece, 2½ years old, typed on her toy laptop and began to fret, "So much work! This is giving me a headache-lah." I laughed not just because I can see her tiny self doing exactly that - she was clearly imitating her mum - but I used to do the same thing. When I was 7 and helping my mum with small chores, I would take a break to wipe the imaginary beads of sweat off my forehead with my forearm and breathed a heavy sigh. And it is the same in the kitchen. My mum never taught me to cook as in "For today's cooking lesson, we are going to make ....", but many things she did are imprinted in my mind even though I was not consciously trying to learn from her. Every now and then, I find myself doing things that imitates the way she preps and cooks. It happened again when I made this coconut milk lemongrass broth. I did not follow any particular recipe, and conventional preparation requires me to slice the galangal thin and chop the lemongrass into 1-inch pieces. But I did as my mum would - I just peeled the galangal and cut it into 2. I cut-off the lower half of the lemongrass and just bruised it. And both go into the pot as-is, so that when I scoop the broth, I can easily remove the lemongrass and galangal. While they add flavor, they are not all that pleasant to bite into. I think she would like this broth. It has flavors that she is familiar with. When I have leftover ingredients, fried rice is usually a sure bet. Mixed vegetables - carrots, long beans, any greens - and perhaps a handful of meat, all so easy to throw into the wok. But sometimes, I have the odd herb or two that didn't quite make it into the food processor for the rempah (spice paste) for a Malay dish like sambal goreng or mee rebus. Lemongrass, galangal, kafir leaves - when stored in the fridge, they are good for a few days. But if I don't feel like making more rempah, this coconut lemongrass broth is my go-to meal. It is so easy to make and I still make it even when I don't have the exact quantity of ingredients, for example, if I just have 1 lemongrass or an inch of galangal. I just let the broth simmer a little longer. If you have never used lemongrass or galangal, I think this broth is a perfect introduction for a first-time attempt. 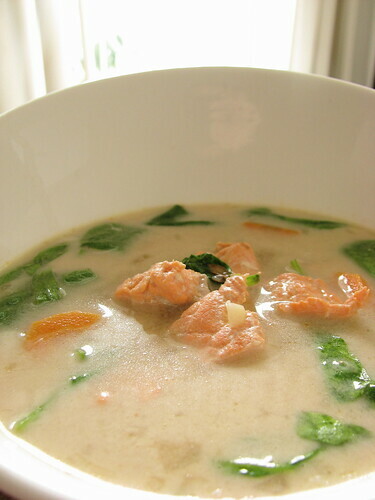 This broth is a take on the Thai dish tom kha gai, which means "boiled galangal chicken" and usually provides gravy for rice. I make it less thick so that I can drink it directly - perfect if you just want something light. S stirred some brown rice into his. Instead of chicken, I used salmon. I also added carrots and spinach because I had those at hand. There is no heat but feel free to sprinkle a little red chili peppers like my husband did. 1. Heat the oil in a saucepan at medium heat. Saute the minced shallots until caramelized and then add garlic and ginger. Stir for about 1 minute. Take the bottom part of the lemongrass and bruise it - I use a pestle. 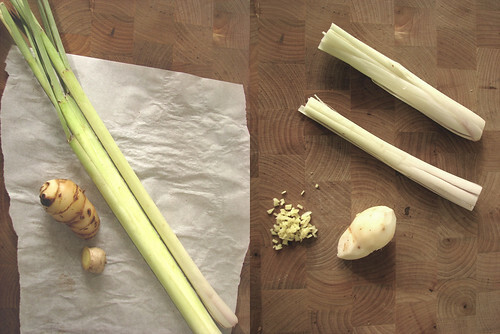 If the galangal is larger, cut it into 2. Put in the lemongrass, the galangal and fish sauce. Stir until fragrant, about 1 minute. Put in the vegetable stock. Bring to a boil and then let it simmer at a lower heat for about 20 minutes. 2. Pour in the coconut milk and continue to simmer for about 5 minutes. Cut the salmon fillet into 1-inch cubes. Put the salmon cubes in the broth to let it poach. 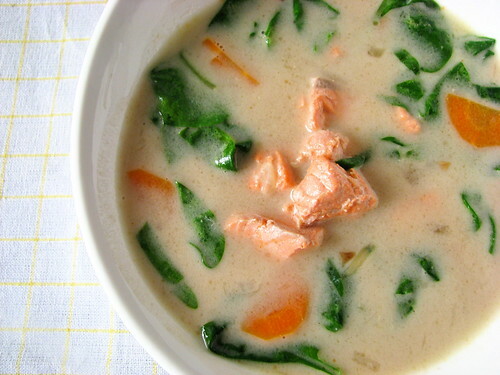 When the salmon becomes opaque, throw in the spinach. Stir gently and switch off the heat. Serve immediately. Would you like to contribute this post to Foodshots, an online collaborative arts project that showcases the very best in food blogging? You can read more about it here. I might try this. If I can't find galangal, can I use extra ginger or something else? Hi Sarah. Galangal adds a distinct flavor. Ginger is not a true substitute but you can still try the recipe and see if it tastes good to you. I would add an extra inch of ginger and let it simmer a little longer. Let me know how it goes! Hey thr, wat's the best substitute for coconut milk without spoiling the taste? Hey. Thanks for the great recipe. To the poster above, I've tried with Half & Half milk replacement because I dislike the flavor of coconut milk and it came out great. I was excited to find this recipe. I love the flavor of lemon grass and Thai food in general. I made this dish last night and found it to be surprisingly easy to prepare. As a matter of fact, I'm eating a bowl of this soup right now...So good! I doubled the recipe and ended up with two large bowls of soup. I couldn't find galangal so instead I added extra ginger. I also added shrimp and bok choy. The recipe doesn't tell you when to put the vegetables in but when I was ready to add the coconut milk I put in the fish and vegetables. I probably put the vegetables in to soon. They were good but I like my carrots crisp in soups like this. I will definately make this dish again! When do the carrots go in? Not in the directions. Thanks! I'm making this tonight. It was delicious. I added the carrots with the vegetable broth and they came out just right. Great recipe.